Our services include retail freezer orders which can be telephoned in to our Keirby Walk shop where they are cut to order by our master butchers then bagged and labelled, they can also be delivered locally free of charge. We do not send perishable meat products by Royal Mail or by courier service as they require special temperature controlled packaging and we cannot guarantee that they will arrive on time and in excellent condition. 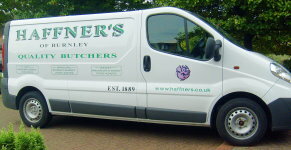 So, we only make our own deliveries in the Burnley & Pendle area.